Why avoid genetically modified foods? There are plenty of reasons; namely, your health. But you might hear people regurgitate the same old biotech slogans, when really it’s about feeding a bottomless bottom line and propelling an even bigger agenda. We need GMOs to feed the growing world population. We need GMO rice, genetically modified with vitamin A to prevent blindness in poor countries. Building on that, here are five more with a video guide – a couple of them are saying the same thing but are elaborated in this write-up. This is the “good intentions” angle because it certainly doesn’t deliver. A 2009 report by the Union of Concerned Scientists showed how genetic engineering absolutely has not increased yields. It’s been proven that GMOs give their transgenic material to the weeds they are designed to combat – which means more superweeds and subsequently, less crop yield. Big Agri pays little attention to soil health and encourages pestilence with monoculture. But there is a resurgence of interest in biodiversity from polyculture with great success. Organic farming in Africa increased yields by 116 percent. There are people around the world who grow giant vegetables naturally. Russia feeds its people with community dacha gardens. Will Allen is a renown urban farmer who creates tons of food in winter without heat. Innovation abounds. Rotation is a solution even for large-scale farms seeking help from GMO-induced pestilence. Food goes to waste in our country and there are regulations that keep perfectly good food from hungry people. In other places there may be food, but no money to buy. A Gates/Rockefeller-fueled project of the International Rice Research Institute ended when around 400 protesters in the Philippines trampled it – they didn’t want “the help.” IRRI is going to force it on them anyway. To say that there is only one solution to feed the world and it involves marring the entire ecology is absurd and false, as it does not work. If that solution is so great, then why the need to force it? Why would the biggest producers of chemical pesticides create a product that would kill their biggest product lines? If GMOs really reduced pesticide use, their profits would be going down, not up. And farmers wouldn’t be forced to double down on pesticide use in the presence of superweeds and superpests. The rise of glyphosate-resistant superweeds has increased pesticide use by 183 million kilograms in the last 15 years according to a 2012 report. And how would they know? How would the FDA know? The FDA doesn’t test, but literally takes the word of the corporation. Finding out GMOs pass their transgenic material into the surrounding environment took years because biotech companies do not allow academic testing of their patented, heavily guarded products. We are expected to be human guinea pigs over one of the biggest food and ecological impacts – that never had any real testing. One would think at least a year of testing would be in order, but the full health impacts of GMOs remain to be seen. However, what little independent testing that has been done shows a pattern of cancer, obesity, liver failure, digestive disease, infertility, and immune dysfunction and that pattern does correlate with global disease spikes in those diseases for the last 15 years, although GMOs are not the only factor. In other words, genetic engineering and conventional breeding (for thousands of years) are the same exact thing. Many journalists pump out this oft-repeated lie. Or they might say, same thing just faster. When you realize what natural breeding techniques like selective and cross breeding look like compared to the intensive lab genetically engineered plants – it’s completely ridiculous to try to put them in the same universe. There are a couple angles to this one. Big food companies and grocers tried to claim it would raise the average person’s yearly grocery bills by $400. That is ridiculous, as food companies clamor to get your good faith back with label changes. “No high fructose corn syrup!” and “Gluten-free!” even on bottled water are prime examples. We’re talking about three words “genetically modified ingredients.” Some companies wish to disassociate by joining GMO-Free projects and wearing it like a badge on their products. But the main reason stated for not labeling is insulting and nonsensical: That it would unnecessarily scare the consumer. Because more information is frightful and we shouldn’t know about what we put in our mouths. But that has not happened in European countries who adopted GM labeling. Informed consumption goes on…. GM food will never be labeled in America, but raising awareness and making the demand and sticking with it is a great thing. Rachel Parent, the 14-year-old activist stuck with that point even though shyster show host, Kevin O’Leary, who was debating her constantly tried to get her off the point – even calling her a shill. If the majority of people are screaming for a simple label that will not be provided, there is obviously a much bigger reason. To see why and where the prevalence of GMOs really stems from, see the book referenced below. Turbeville, Brandon. 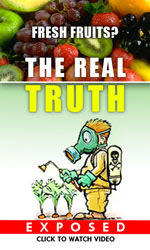 Codex Alimentarius: The End of Health Freedom 2010. P 138. Be the first to comment on "5 More GMO Myths Debunked"